Just a quick update before the Easter weekend starts in full. I shall be unavailable until Tuesday as I will be taking a few days’ rest. I’m actually feeling great, but a new bodyweight training programme that is 5 mornings a week has my muscles screaming for some pampering. Plus, I shall also indulge in some Champagne and chocolate… ok a lot of Champagne and chocolate over the coming days. We as a family are not big drinkers by any means, but it is Easter after all and I have worked very hard this year… well that’s all the excuse I needed. Trading has been awesome and also my new students are picking up the pace. I must say it has been an absolute pleasure in teaching them all. I feel truly blessed to have the opportunity to do so. 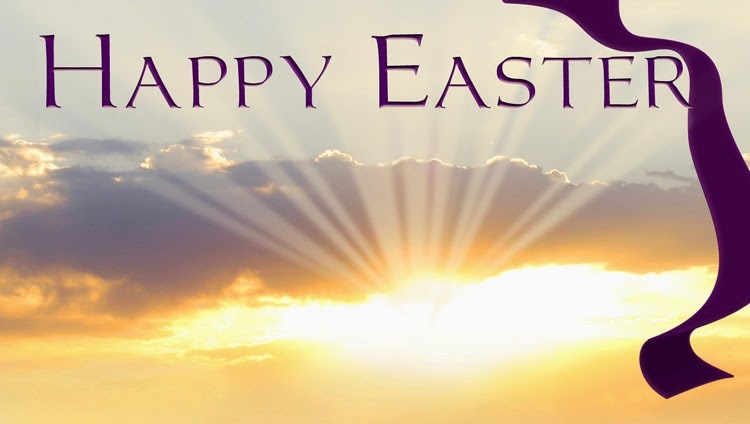 My points profit total from last Friday up to this Easter weekend [as I write this Good Friday Morning] is just over 1700 points… that is not a typo. 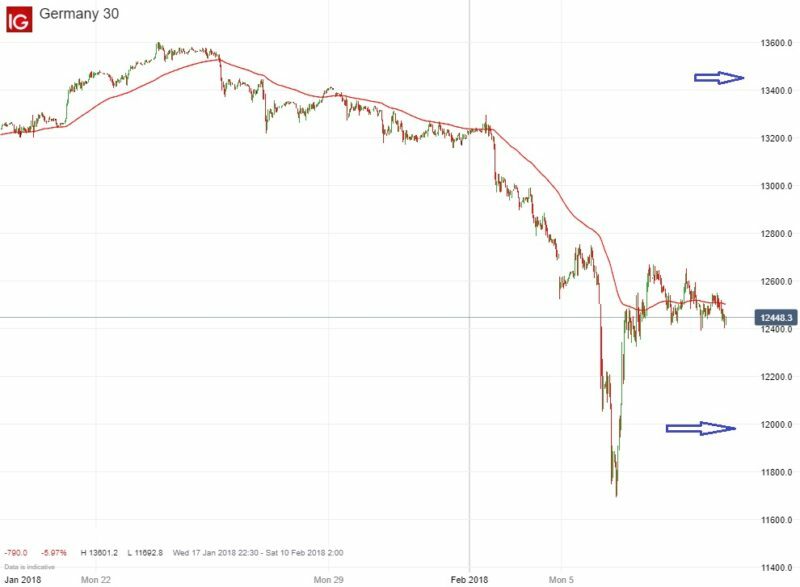 Obviously the results in points are not always that huge, but my Bitcoin trade using the system that I published here for free on the blog last week, made up a large chunk of those points. Then there were some good DAX profits too. 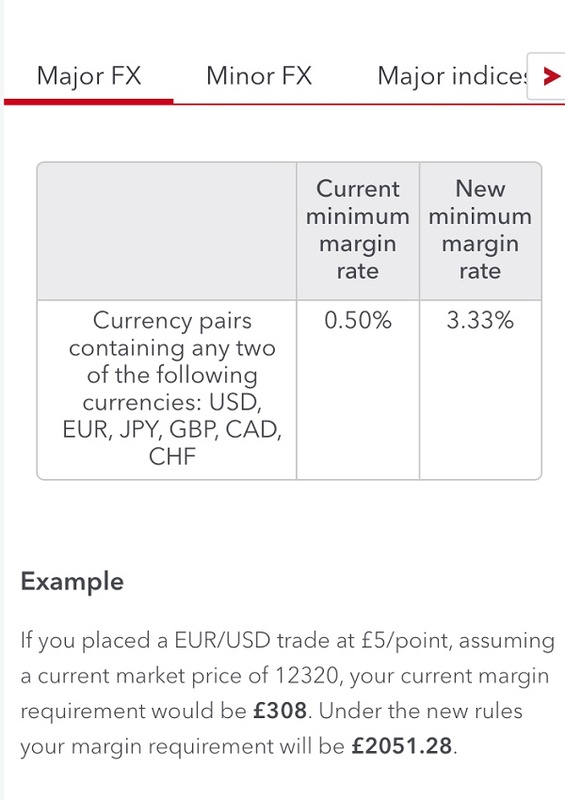 The ESMA have now finalised their stand on margins for spread betting retail customers and CFD traders. 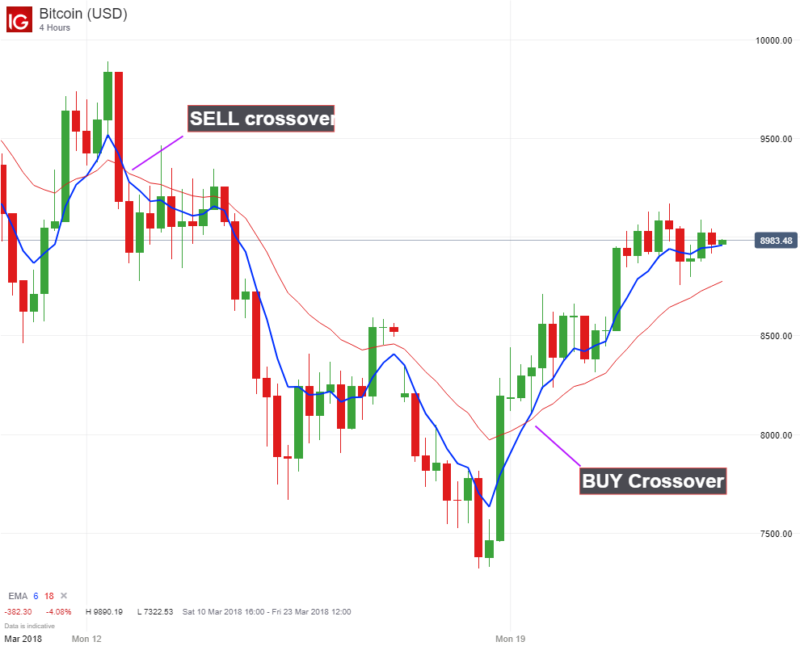 This basically means that all nonprofessional traders will need to hold a bigger account balance to trade the same trades that they are already trading. Or if you are new and opening an account then you will need more money for margin to trade. The impact looks something like this. In my opinion this will not make any difference to anything. The retail traders that make regular money will continue to do so. The gamblers will continue to lose. If the ESMA are seriously worried about preventing retail customers losing money from trading or gambling, then they need to step into sports betting and trading to make a bigger difference! Anyway, not to bring a downer to anyone over Easter, if you learn to trade properly then you will make money long term… margin requirements just need to be bigger, that’s all. Phewee! It has been a very busy couple of weeks for me since the launch of my new spread betting course. Busy, but thoroughly enjoyable. I have really enjoyed meeting everyone and giving support when needed. All the places are now full. In fact I am oversubscribed by 6. This was due to a little rush of students signing up on the last evening before the doors closed. Anyway, the course is something that I will keep you up to date on over the year. Now I’m going to get back to blogging for you. As you probably know, my partner Chris helps me out a lot with the private members areas. However, he has suggested doing some new trading videos for this blog from time to time to teach trading along with my blog posts. I’m useless at Vlogging and although Chris can do all the editing, it is easier if the videos are clear and informative with less editing from the start. I shall upload the videos to the blog and to our YouTube Channel. As always, I’ll be offering you longer and short term trading ideas over the coming year. These ideas combined with the videos will really help new traders grasp the trading concepts at a quicker rate. More importantly though, is that the combination of text and visuals that will help clarify more with less room for error. I still love trading along with Vince Stanzione, I like the slow steady pace and long term outlook that he offers. However, I can’t deny that shorter term trades have become a larger part of my portfolio… and certainly so over the last few years. Having the ability to trade over the long and short term is a great asset to have. If you are looking for a strategy to spread bet on a daily, take a look at the DAX breakout system. It’s great for steady gains over the long term even though you are only trading from day to day. 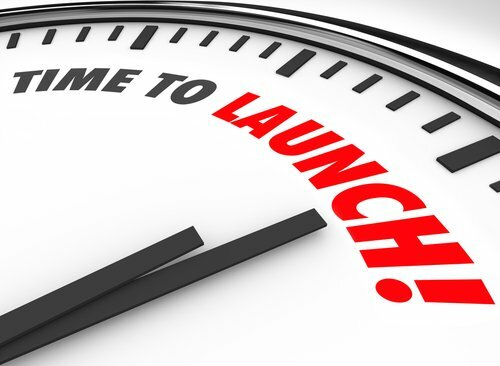 My new spread betting course has launched… and a spectacular launch it was indeed. This morning, only a few places for new students remain. This is a screenshot of my trade on the morning of launch day. 260 points profit, [that actually peaked at 340 points]. The thing is that this is not a one off fluke. This is a normal occurrence. A standard trade setup if you like. There is nothing to stop you learning to do the same. What’s more is that this trade was made using just one of the strategies from the spread betting course. Is my Spread Betting Course for you? If you want to learn how to trade over the medium term and see your results compound from month to month, then I say wholeheartedly YES! My new Spread Betting Course will be ideal for you. The strategies included in the spread betting course are fantastically profitable, easy to implement and also easy to learn. You don’t even need a huge trading bank to get started either. There’s no high octane promotional jargon to plough through or consider to gain access to my course. There is a simple sales page here that I have written myself, detailing the course and introducing me to those that have not heard of me before. That said… I only have a few spots left before all the places are taken and then the offer will be finished. So the page will be surplus to requirements very soon anyway. If you want to join me and learn how to trade in what is essentially like a one to one environment, then you need to act quickly… Really quickly! You can read more and order here. My new spread betting course is almost ready to launch. I’m really excited about it, as is my partner Chris. Chris has been doing all the videos and editing them. The combination of us creating the course has worked even better than I expected on this occasion, everything really came together professionally. We have also built a new private members website to host all the course content. This eliminates any confusion as to where to go for what information and keeps the blog seperate. 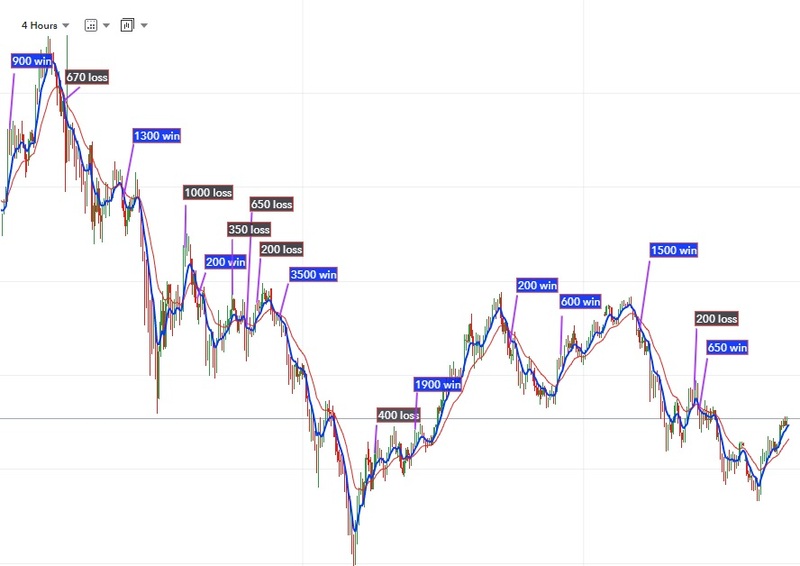 The videos are clear and brimming with trading detail. The written content I have created has been done with an easy read style with lots of images to explain the concepts. This is then followed by the video training. I am also going to keep adding content to the private members area for the spread betting course. This content will be showing live trading and will also include any new trading strategies. The course has four different methods of trading that are all explained in great detail. The reason for the four strategies is that one single method will not work for everyone. Everyone has different strengths and weaknesses when it comes to trading. These combined strategies will suit most types of trader. There is no claim to anything in the course being 100% mechanical and set and forget. That is not reality for these strategies. Some are pretty hands off indeed… but there is still some effort involved on your part, although minimal. So, if you’re looking for a system that just makes money on auto pilot, then I’m not going to be able to help you there… but good luck in finding it and if you do, please let me know as I want to use it too. The work that goes into the creation of these products is very heavy! 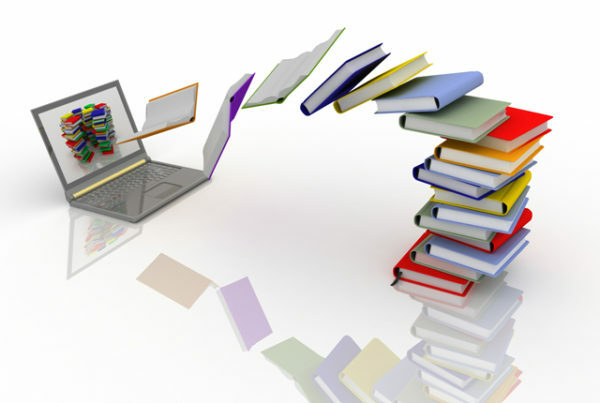 In fact, it takes such an effort that we will not create any other trading courses after this. This spread betting course is to be my flagship system. It will be updated regularly, but I will be not be creating another product again from scratch. My customers, readers and subscribers are awesome [you know you are]. Even the most awkward and hard work of you I have grown fond off. I want to keep this relationship going and keep offering 110% effort when it comes to customer service. I completely understand that some of you need far more assistance than others and I want to be able to help if the need arises. To continue to make this possible, I have decided to limit sales of the course to 50. This may seem low… but emailing and taking care of you is very time consuming; so 50 students is what I believe to be somewhere near manageable without exhausting the hours in my day. If I get any dropouts then I will offer the place to someone else. There will be a discount offer on launch day as well and that will run for the first week. If I fail to fill all the places in that first week, then the price will then go up to its regular price regardless. I’m buzzing about my new spread betting course and I am looking forward to helping you learn how to trade over the coming months. Keep an eye on the blog and your email for the 24 hour pre-launch notice. Trading the financial markets can be full of pitfalls and hurdles. 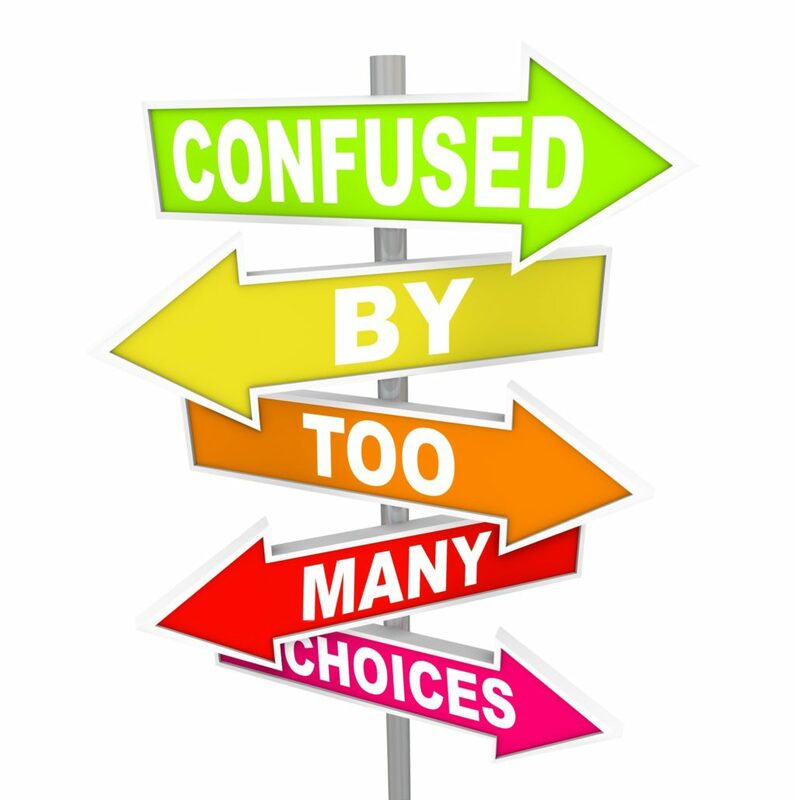 So many conflicting theories and different advice to consider… and that’s before you have even opened a single trade. However, one key that can help you step into the wealth that trading can offer is discovering and accepting what type of trader you are and trading to those strengths. Traders can be whittled down into a few common types of personalities. You are a day trader. When I started trading, I was predominantly a long term trader. My positions stayed open for months at a time and were then rolled over. I still am a long term trader. I tend to buy actual stocks now and spread bet a little less over the long term. However, writing this blog is what helped me develop as a shorter term trader too. I don’t actually need to trade short term from a financial perspective. The fact is that I have enjoyed the challenge of learning how to trade shorter term and also enjoy helping others learn the ropes of short term trading. But what advice can I give you to start trading or improve your trading from this point today? Decide on what kind of trader you want to be and stay with it, or accept what trader you are and trade to those advantages. Obviously you may not know what type of trader you are at the moment. So I’ll give you some examples of the different options above. You’ll then have a clearer picture of what will or may suit you. The long term trader will look to hold multiple positions for months and years. They will take long term spread bet contracts and also buy and hold stocks. The Long term trader has no pressing engagement to create immediate wealth. They are delighted to make 30% a year. If they only made 10% they’d still be more than happy. Long term traders are calm and relaxed when thinking about their portfolios. 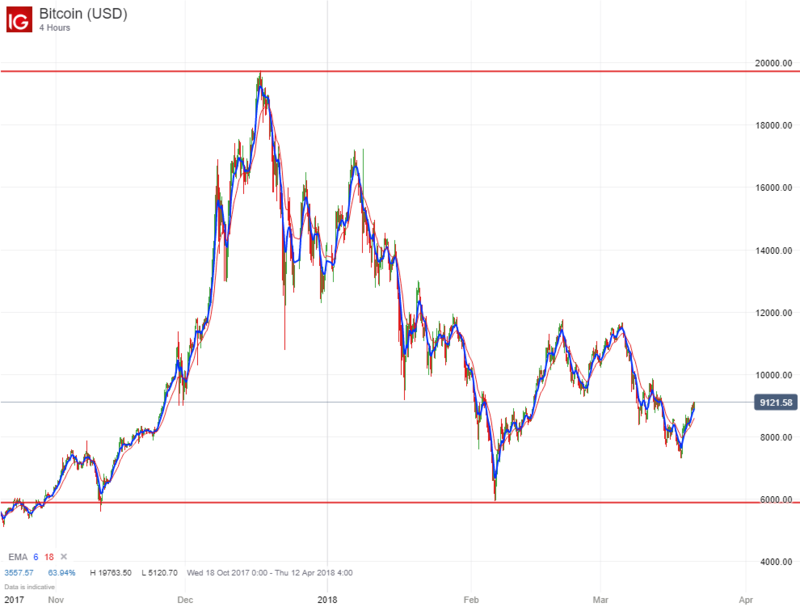 The Long and short term trader will look at holding some positions for a points profit target or until various technical indicators give a signal to exit a trade over the short term. These traders will look at trading over days and weeks, with trades occasionally slipping into a month or more on the short term. They will buy stocks and ETFs to hold long term and balance their portfolio. Some of these traders can do exceptionally well, but they are far and few between. Most are far better off just trading long term, but rarely realise it. The shorter term trader may trade a single indice or multiple forex pairs. Maybe even a combination of both. They rarely trade individual stocks. Their trading style is full on and they will be busy at trading throughout the day. Cast iron discipline is needed to be profitable in the day trading arena. Day traders also need the ability to follow a strategy without any sort of deviation what so ever. Most day traders lose money and are rarely prepared for the reality of financial trading. Day traders often blow their entire bank within 3 weeks. Obviously the above personalities are examples, but they are quite accurate from my experience. Trading success starts with YOU and the foundations you lay. You need to decide on what you want to achieve from trading before actually starting trading using funds. Plus, you’ll often find the reality of trading is far different than what you expect. So you will need to adapt and be ready to do so when called for. Trade to your personal strengths and remember that the style of trading that suits YOU best is the one that makes YOU money… regardless of being long or short term. Volatility in the markets has been bonkers over the last couple of weeks. Everything that shouldn’t happen, seemed to happened for some traders. On the other side of the coin, some of the volatility has been a bonus to many. My new German 30 strategy that is included in my new trading course has made some serious profits over the last few weeks. Over 1000 points profit to be more precise. 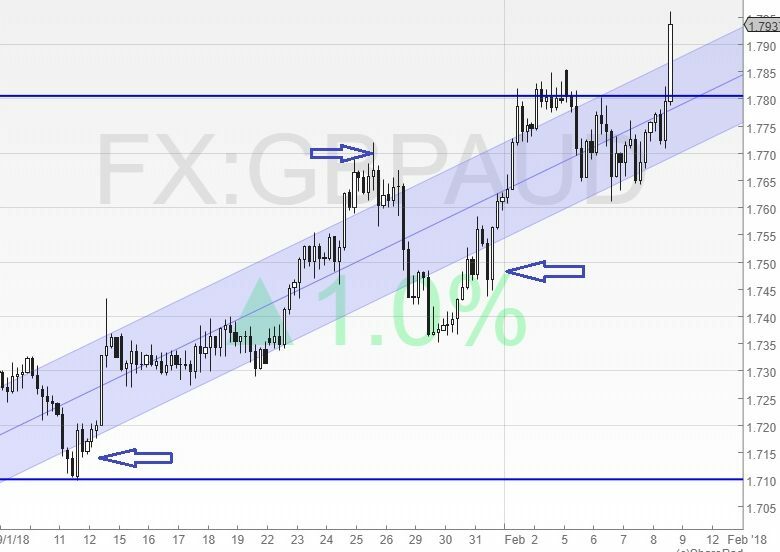 The forex trading strategies in the course are also showing steady profits using 4H charts with simple price action and swing trading. Most share prices have taken a hit recently. In my portfolio though, you have to remember that practically all of those positions, I buy the actual share and hold long term. I don’t spread bet shares as often anymore. I do not use stops on those shares either. If shares lose $10 in a couple of weeks it is of little concern when you know you are likely to hold these for the next few years at least. A true market crash isn’t going to happen over a single evening. If all pointers were leading to a bear market then I’d be out of my shares and into something else. You adapt to the markets and prosper… if they change you change. Of course there is always the option to stay out of the markets completely if you are in doubt. The financial news has been making me laugh [even more than normal] lately. The reports they dish out regarding cryptos is beyond erratic. Within 48 hrs , reports read, the bitcoin bubble had really burst and then the following day bitcoin was going to reach $50,000 this year. Better just to watch the price as it doesn’t lie. I still say bitcoin will go past $25,000 and up to the $50,000. It has been battered lately yes, but it will find its feet again and there will be a good chance to buy in again this year. A great way to start bitcoin trading is with the XBT tracker, if you think it is going to rise that is. 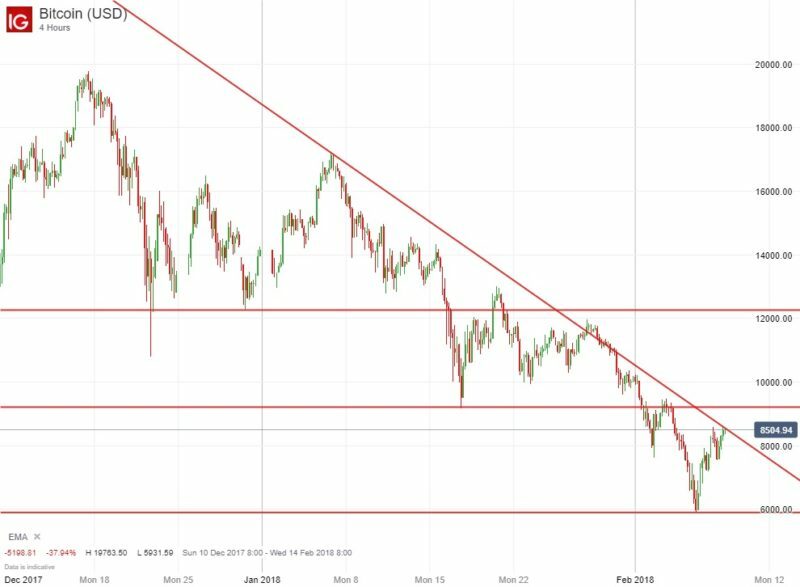 However, drawing support and resistance lines and levels is proving to be one of the easiest ways to spread bet and trade bitcoin over the short term. After a much needed rest, I’m ready to hit 2018 with a clear and stress free head. I hope that my recent break will be one of many this year; as I am planning to go to Spain and Portugal more often over the coming year to look at properties to buy. If we don’t buy anything, then we will rent a place long term. It is actually a very cost effective way to holiday more without the commitment of owning. You can rent long term for around 400 euros a month and still be central enough to social life and even beaches. Whilst buying property sounds or seems like a good investment on the face of things, it’s actually not that great when you analyse the returns. That’s why I think renting is not as bad as it’s made out to be; as long as you are also investing sensibly elsewhere. The returns on our recent house sale equated to just over 3.7% a year with a total return on investment of 39.42% over the 10 year duration. These ideas are simple, steady and strategically sound investments that anyone can follow and take part in. You don’t need any special skills, publications or subscriptions to take care of your own wealth if you are looking for slow steady returns. On top of those return, I make more with the selections I get with Vince Stanzione… His stock picking is absolutely amazing. What have you got planned for investments for the next 10 or 20 years? You can invest in property like traditional UK homeowners do and get around 3% a year returns, or maybe you can act like a professional and have investments in both? However you look at it, investing in the mentioned ideas above beat the returns of property investments hands down. Let’s look at what an average deposit on a house [£35,000] looks like after compounding interest over the next 20 years compared to investing the same amount in the markets and receiving various other percentages of investment returns. It’s clear and safe to say that there are better investments available than property nowadays. Another strategy to consider is… If you invested as above long term and then had another smaller account to spread bet with short term , then you could just keep reinvesting your short term spread betting profits into a longer term account. You could actually buy shares and hold them. Schwab and HL are good places to buy and sell stocks. 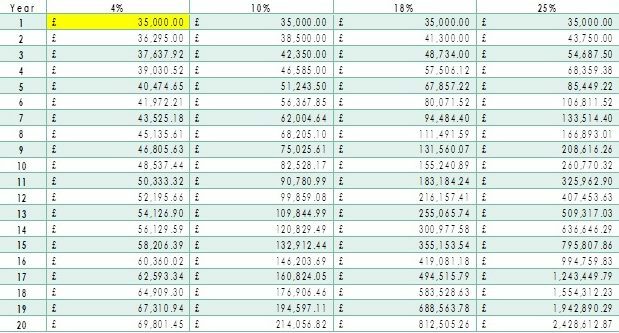 You could build your spread betting bank up to a figure where you could take out your personal living expenses every month and then also add an affordable £1000 each month to your long term share trading account. Now that’s a plan with sensible leverage. It is quite possible to do this after a year or so with a good spread betting strategy. So using our £2000 bank and returning on average 25% each month. You then compound your profits for a year. If you hit a modest 18-25% return, this gives you a bank of more than enough to generate an income to live on, enough to regularly add surplus to a longer term trading account and enough to also keep compounding your initial spread betting bank. Doing this over 10 or 20 years may sound too long right now, but it isn’t at all. Think how quick the last 5 years have gone? Now I understand that not everyone has 35K lying around to invest in a long term trading account as in my example above… but most wealthy people didn’t start out with mountains of cash either. However, building your wealth slowly and surely is the idea here. A small spread betting account making 8% each week [24% Monthly] can grow amazingly fast if you keep reinvesting your profits… and look at what can happen if you hit 10% a week. So for example, if you were trading 8 positions over a month, with a realistic 50% strike rate [50% is actually conservative]and your losses were [obviously] kept smaller than your wins we can expect a positive outcome. If you return a 2/1 basis, then you should be able to make 8% + a week returns on average. Example: you risk 50 points to make 100 and only half of your trades were ever winners, you’d still have created a successful and profitable edge for yourself. It doesn’t take long to accomplish these types of returns if you are realistic from the start and if you avoid falling into the trap of overnight success syndrome. I will be covering more about all of this in my new spread betting course. 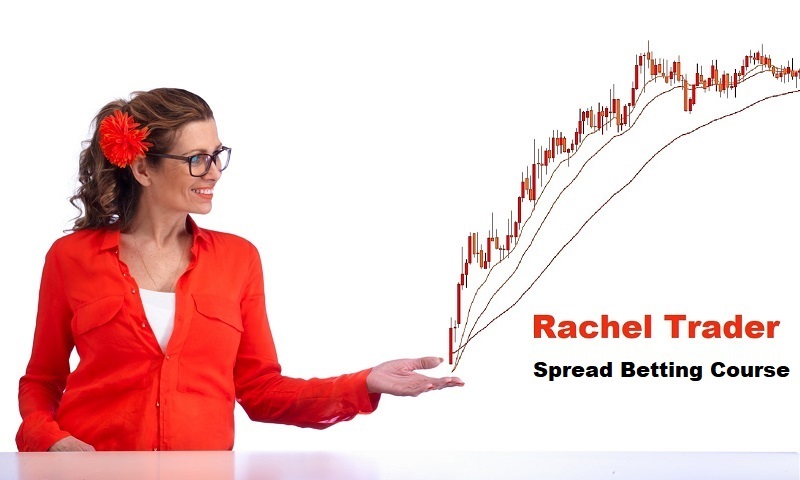 Here is my Rachel Trader Compound Interest calculator Rachel-Trader-Compound-Interest.xlsx that you can download and keep. You can add your own values in and see what sort of returns you can get. Remember, be realistic. You won’t make a guaranteed set percentage every week or month… in fact sometimes you might even lose 10 or 20%. Over time though, with a solid strategy and discipline you’ll come out on top. Also… I have mentioned this book many times before… if you have never read The Richest Man in Babylon, do yourself a huge favour and order a copy. It is one of the best books you’ll ever read on how to create wealth.